Half a century ago The Big Match was just completing its first season. PHILIP BARKER recalls how John Bromley and Jimmy Hill revolutionised televised sport, long before Sky. This particular revolution was televised in black and white but “was a programme that, without argument, transformed the coverage of football on television. An imaginative, full-throttle programme that drew our audience in to enjoy it all with us,” said Brian Moore, popular presenter and commentator for the programme. Former SJA chairman Bromley was in charge of ITV’s other flagship, World of Sport, but his populist hand was clearly visible in The Big Match. It had a big following amongst youngsters and was transmitted just after Sunday lunch. Even the theme music written by Keith Mansfield was entitled Young Scene. In those days London Weekend Television was based at Wembley. Hill and Bromley promptly took their entire programme team to the stadium next door for a publicity photo in full football gear. The first programme was supposed to be Spurs v Arsenal. Industrial action meant viewers saw a re-run of Manchester United’s 1968 European Cup final victory. Strikes dogged ITV throughout that season and sometimes even TV Times was printed in black and white. “I commentated on that match from the building site that was QPR’s new main stand in the making,” recalled Moore. Jimmy Hill provided the tactical analysis and players were regular studio guests. Bromley took this a step further when it came to major events introducing a panel of experts. The idea was to appeal to two imaginary, but typical, ITV viewers called Fred and Freda. 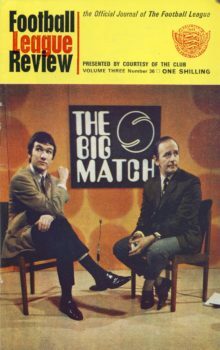 Although only seen in London, the south east and the Channel Islands, The Big Match featured matches from other ITV regions. 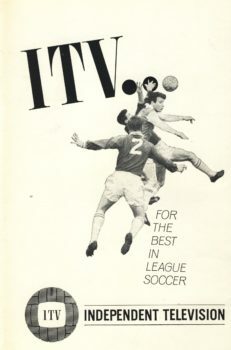 “The pictures come from ATV, the commentator is Hugh Johns,” was a typical introduction. The programme was also shown in Australia, so cricketer Max Walker was an enthusiastic studio guest during an Ashes series. There were soon regular ‘fun spots’. Whoever would have thought that running action back and forth to Gimme Dat Ding by The Pipkins would cause such mirth. Perhaps they piped laughing gas into the studio? At Christmas, guest presenters included Terry Venables, Bobby Moore, later Kevin Keegan and even Elton John. “For so long, football on television had been earnest, worthy and a bit po-faced,” said Moore. Bromley and Hill changed all that. At the end of the first season, viewers were asked to select their golden goal, two years before BBC introduced their goal of the season. Martin Peters of West Ham United was the first winner. Even the judging was televised. Victor Railton of the Evening News joined the Standard’s Bernard Joy, Spurs keeper Pat Jennings, Newcastle striker Malcolm Macdonald and, of course, Hill. The Football League Cup final was an ITV exclusive, but although played on Saturday, not shown until Sunday. In 1969, the FA Cup final was shown in black and white for the last time. LWT soon splashed out £3million on “the most comprehensive colour tv centre in the independent television system” according to chief engineer Brian Pover. When Arsenal reached the 1971 FA Cup final, Hill wrote them a song to the tune of Rule Britannia and it was launched on The Big Match. At another match at Highbury, Hill put on a tracksuit and ran the line after an injury to an official. In 1975, Wimbledon goalkeeper Dickie Guy was whisked to the studio after he’d saved a Peter Lorimer penalty in the FA Cup against Leeds United. By 1978, ITV even had a player cam of sorts, long before Sky tried the idea. Ossie Ardiles was the star featured. The sequence was cut to Lindisfarne’s Run for Home by Jeff Foulser, now supremo at Sunset and Vine. Later the programme went through a makeover for transmission on Saturday nights. Then one Sunday in 1983, Tottenham’s win in the first division against Nottingham Forest was shown live. The commentator for this tv first was still Brian Moore. It was all introduced by a face familiar to SJA members, one Jim Rosenthal.